Ai Weiwei's first exhibition in Cambridge, held at The Heong Gallery, Downing College from 17 June until 9 October 2016, focuses on two popular aspects of his work: cubes and trees. The exhibition includes a number of works never before seen in the UK, alongside a film made this year on the island of Lesbos in Greece, where Ai Weiwei has been working with refugees as they arrive in Europe. Ai Weiwei is notable for the breadth of his interests, which include not only his art practice but also architecture, literature, political and social issues and above all, human rights and freedom of speech. The exhibition in Cambridge invites visitors to engage with the grounds of the college, where Ai Weiwei's trees will form an uplifting habitable circle in the main quadrangle alongside existing trees and the College Chapel. His Tree from 2010 will also be on display at the new Tate Modern, which opens to the public on 17 June 2016. Rachel Rose Smith, Curator of The Heong Gallery, said: "Both groups of works attest to the power of Ai’s use of forms, materials and places to reveal more about how we interact with our environments. The video Ai made in Lesbos provides us with a view of a current situation which also proves hard to forget." An artist talk will be held in conjunction with the exhibition on Wednesday 15 June from 3-4pm. Ai Weiwei will be in conversation with Yana Peel, CEO of the Serpentine Galleries and previously CEO of Intelligence Squared Group, at The Cambridge Union, which has previously hosted figures such as Winston Churchill, the Dalai Lama and Salman Rushdie. Ai Weiwei's discussion with Peel will reflect upon his work as an artist and activist who has had to fight for freedom of movement and global communication. Please click here more information on the talk and exhibition. 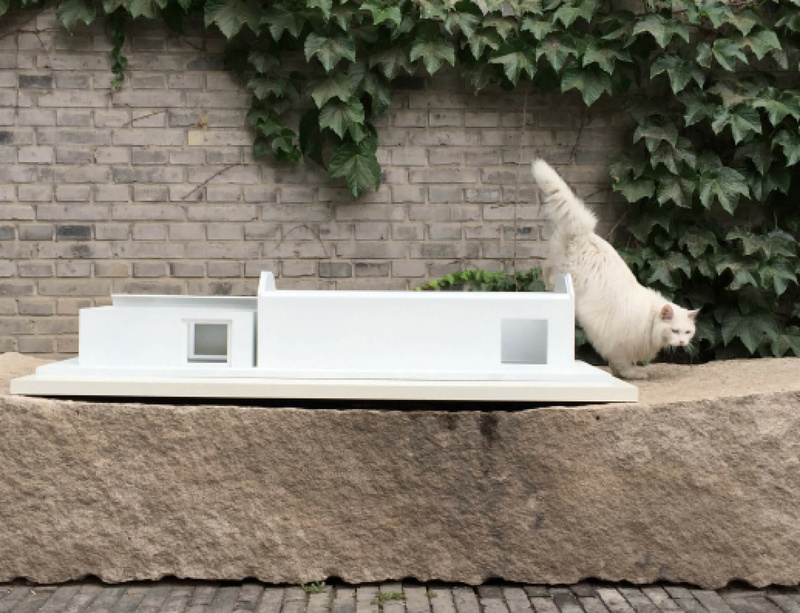 Image: Cat with Heong Gallery model, 2015. Courtesy of Ai Weiwei Studio.